The holidays are quickly approaching. In addition to shopping and decorating I know there will be a few holiday parties on the calendar. I love holiday parties as much as the next person. However I don't look forward to all the high fat foods that are often served. This season I am experimenting with different dishes that can be prepared ahead of time that are not too high in carbohydrate or fat. Thus I modified this meatball recipe from Mom on TimeOut. I like this recipe because it is easy to prepare, tastes great and it won't blow my carb budget for the day. Stir together eggs and additional egg yolk in a small bowl. In a large bowl, gently stir together ground turkey, pork, green onions, bread crumbs, teriyaki sauce, black pepper, ginger spice, and fresh ginger. Optional: to get rid of the "tinny taste" of canned chestnuts, soak the rinsed chestnuts in fresh water with 1/2 tsp of baking soda for 10 min, then rinse, drain, and dice. Add egg mixture and water chestnuts to the meat mixture and mix. Scoop 1 tbsp to form 1 meatball. Roll between palms to get that nice perfect ball shape. Place on cookie sheet that is lined with parchment paper. If you don't have parchment paper, simply spray the nonstick cookie sheet with non-stick spray. This recipe should make about 62 meatballs. Cook for 20-25 minutes, or until meatballs are thoroughly cooked. Serve warm meatballs on plate or large bowl and top with sliced green onions. Use toothpicks to serve. 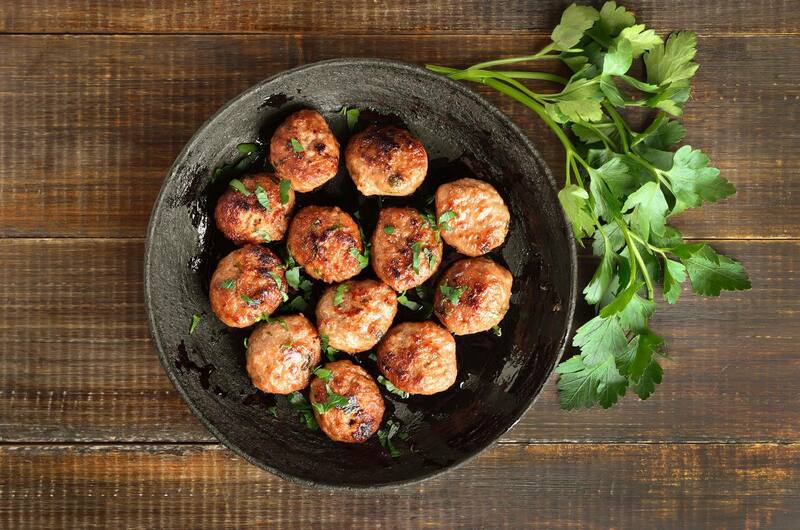 Serve dipping sauce next to meatballs so guests can dip each meatball into teriyaki sauce. There will be about 1 tsp of teriyaki sauce per meatball. Nutrition Information (Serving Size = 1 meatball with garnish and teriyaki sauce): 45 Calories, 2 g total fat, 2 g total carbs, 5 g protein, 283 mg sodium. Good source of vitamins B12 and K.
-Low in fat by using 93% lean ground turkey and 96% lean ground pork. -Low in carbohydrate. 1 tsp of teriyaki sauce contains about 1 g carbs. I found the meatballs to have sufficient flavor without dipping them in the sauce, but you be the judge! -If you need to restrict sodium, then consider using low sodium or reduced sodium teriyaki sauce. -Can easily be prepared gluten free. Simply purchase gluten free panko bread crumbs and gluten free teriyaki sauce (e.g. Kikkoman has gluten-free options). -Recipe may be prepared ahead of time. I reheated the meatballs on the stove before serving by adding a few tablespoons of water and heating covered for 10 minutes. By reheating with water they maintained their moisture. -Portion control can be a challenge. It is far too easy to polish off 5 meatballs which would equal 225 Calories. -While the recipe is appropriate for someone who isn't fond of cooking (the meatballs are not difficult to make) the recipe takes about 30 minutes to prep + cooking time. -Be sure to wash your hands before and after you handle the raw meatball mixture to avoid cross-contamination. I entered and analyzed this recipe in MyNetDiary so you don't need to enter the above recipe from scratch. Instead, you can copy and edit the recipe easily by logging into MyNetDiary via web program. Next, go to Community, and then search "Dietician" with "People" chosen in the drop down box. Click on "Dietician" link. Scroll down Dietician Personal Page and find Custom Catalog. Find "Joanna's Teriyaki Meatballs as Prepared with Garnish and Sauce." Copy recipe by clicking "copy" link on the right side of the screen. Once you do that, you can use that recipe in your own food log without having to enter it yourself. This recipe is also found in Dietitian account - so you can copy from either account. If you have Maximum membership, you can copy and customize recipes or foods. In web program, go to Food tab, tap "Log" in any meal row, then tap MyFoods, find the food or recipe and then choose "copy & customize" option. You can modify any field to customize the recipe (ingredients, yield, name, etc.). Try the 80/20 Rule and Improve Holiday Eating!